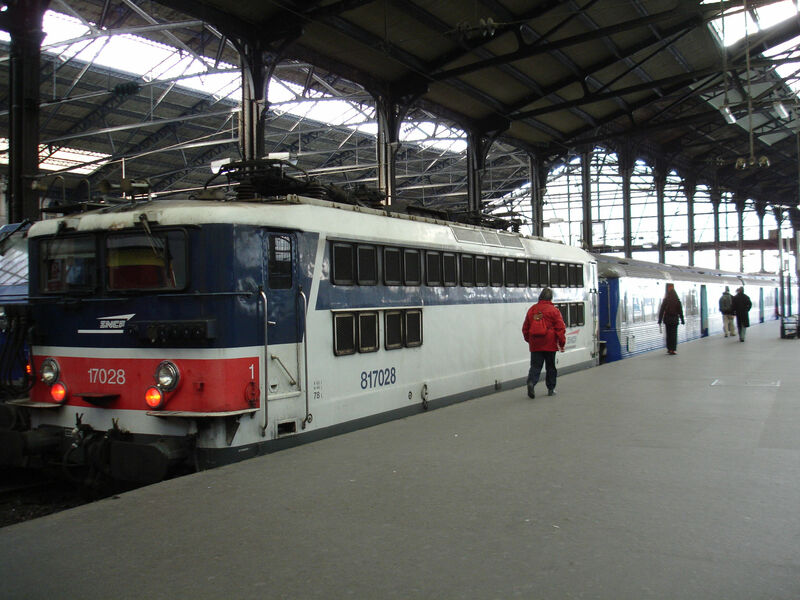 A class BB 116000 (formerly BB 16000) electric locomotive with Intercites coaches. These locomotives were built 1958-63 by "Le Matériel de Traction Électrique" (MTE) in 62 copies. It works with 25kV AC only and it is the AC version of locomotive type BB 9200. The whole series was taken out of use 31.12.2012. Picture by Sanna Siissalo 27.1.2008 at Gare St.Lazaire in Paris. 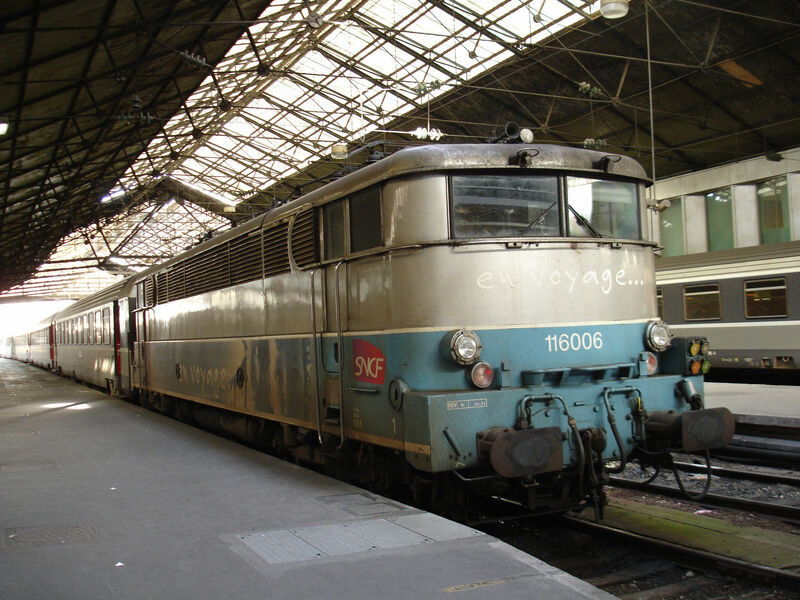 Another similar BB 16000 / BB 116000 locomotive than the one above, but this one in the "En Voyage" livery. Picture by Sanna Siissalo 27.1.2008 at Gare St.Lazaire in Paris. Yet another class BB16000 locomotive and yet another livery. Picture from Paris Gare du Nord 27.1.2008 by Sanna Siissalo. Another view of the same BB16000 locomotive as above. 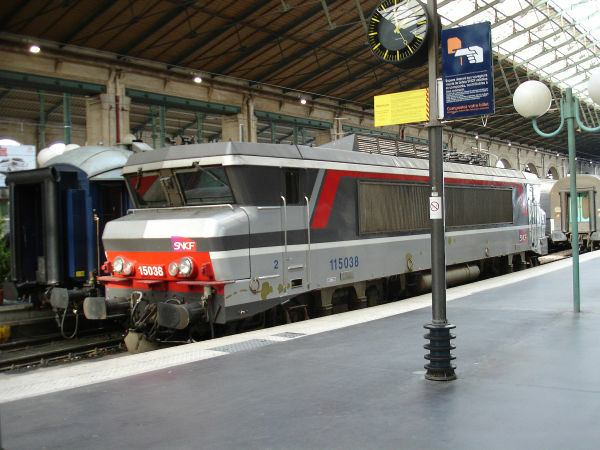 Picture from Paris Gare du Nord 27.1.2008 by Sanna Siissalo. 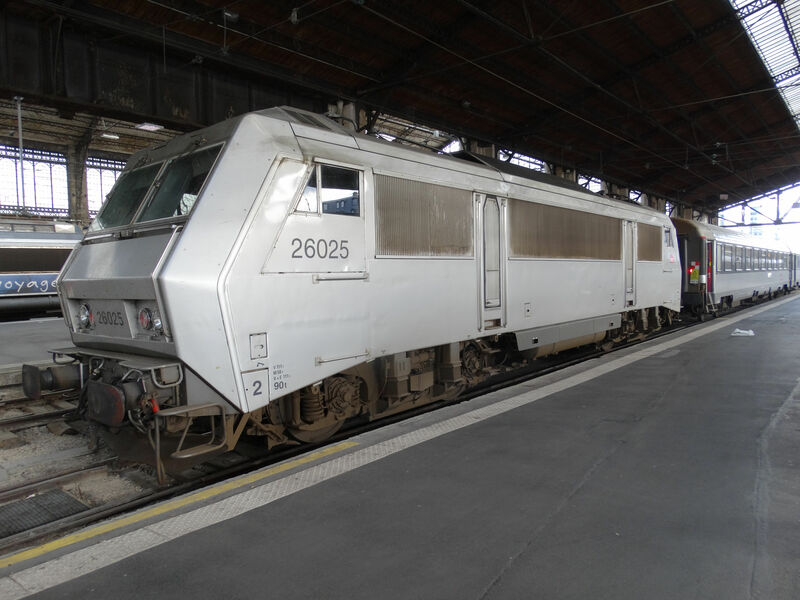 This is a class BB 27000 / BB 827000 locomotive of the type "Prima" of Alstom, used here in the regional "Transilien" local traffic network of Ilé de France around Paris. 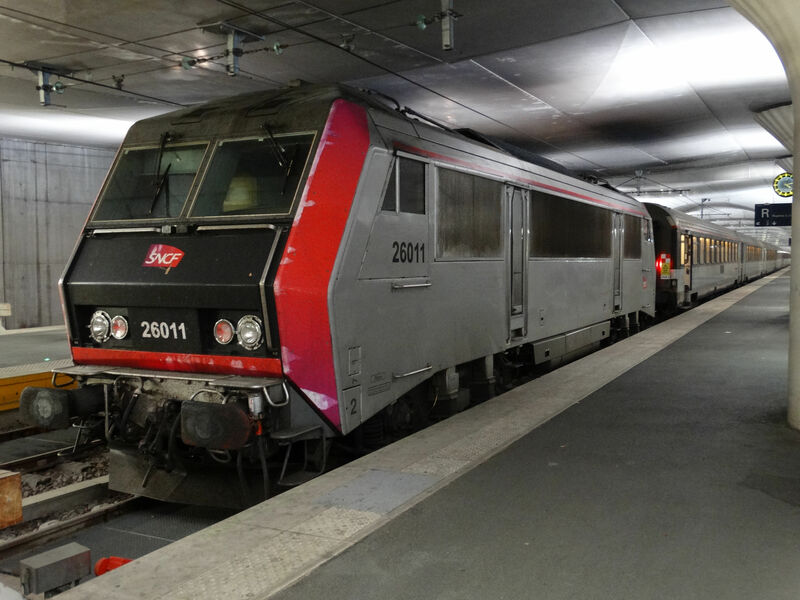 Normally Alstom Primas are only used by the SNCF Cargo part SNCF FRET, but here they are replacing the old BB 17000 locomotives. The Primas were built 2001-2005 in two series and they have a power rating of 4200 kW. Picture by Sanna Siissalo 27.1.2008 at Gare St.Lazaire in Paris. 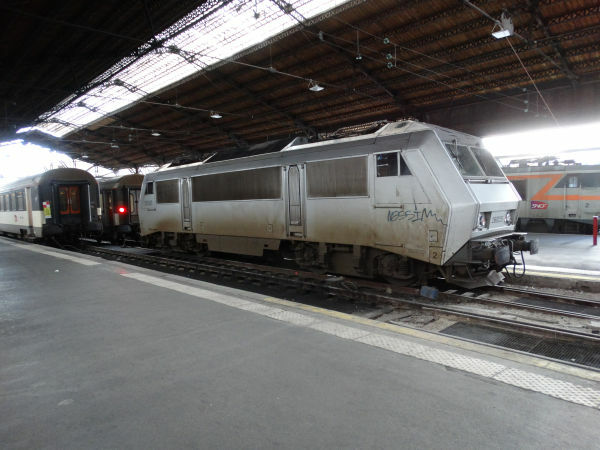 This is the class BB 17000 which the new Alstom Primas are replacing. 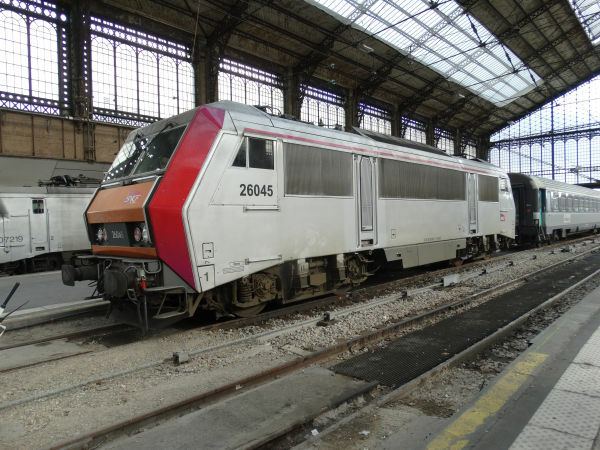 They were built for suburban train duties on the so called Transilien network around Paris 1965-68. A total of 105 locomotives were made by Alsthom. The machine is a pure 25kV AC locomotive and has a modest power rating of only 2940kW. Scrapping of these machines began in 2007. Picture by Sanna Siissalo 27.1.2008 at Gare St.Lazaire in Paris. 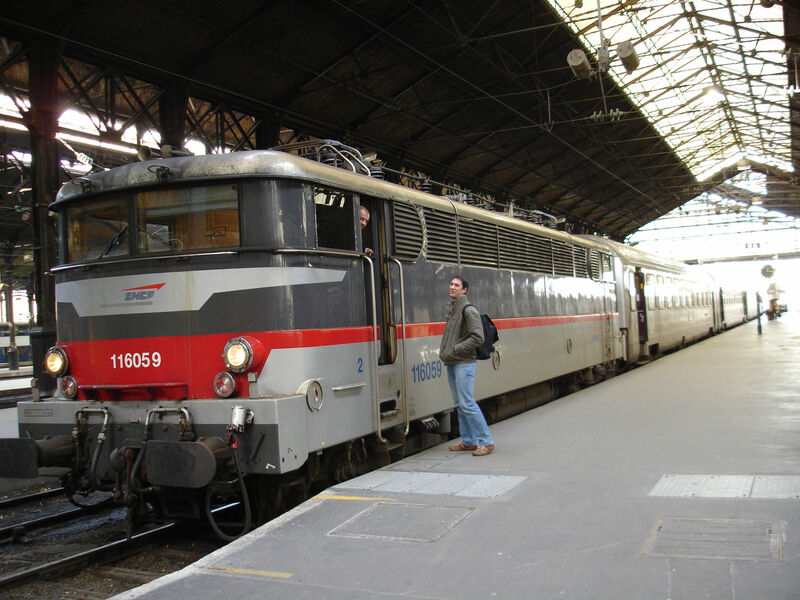 A similar BB 17000 machine as in the picture above, but this one in the so called "En Voyage" livery is seen here pushing away a rake of old regional service coaches. Picture by Sanna Siissalo 27.1.2008 at Gare St.Lazaire in Paris. Two locomotives using DC current. 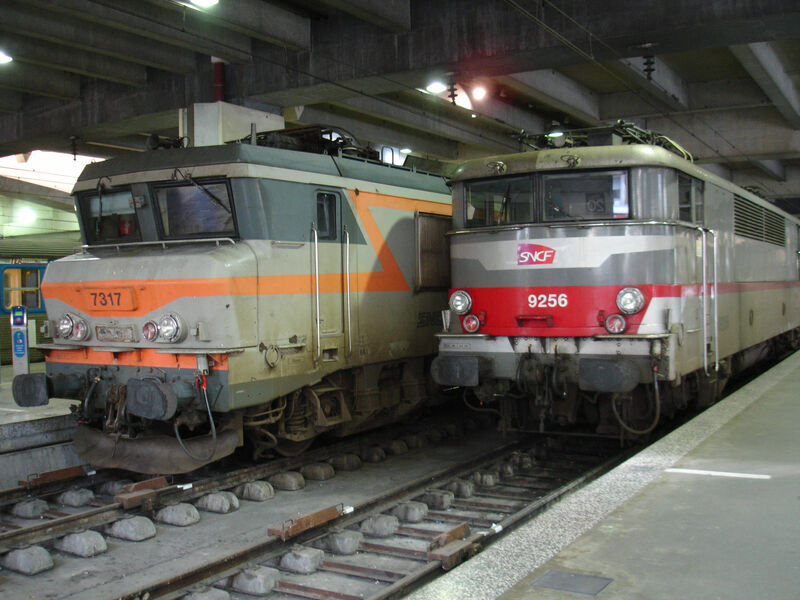 The one on the left belongs to the class BB7200, which is the 1,5 kV DC version of the common "broken nose" or "Nez Cassé" family of locomotives. They were built by Alsthom and MTE 1976-85 in 240 copies. There are three subclasses and this one is from the slowest one, having a max speed of only 100 km/h and a power rating of 4040 kW. The machine on the right belongs to the 1,5kV class BB 9200 built by Creusot-Loire, Jeumont-Schneider and Compagnie Électro-Mécanique in 1957-64. They have now all been scrapped. Picture from Gare Montparnasse 27.1.2008 by Sanna Siissalo. The class BB 15000 is another member of the "broken nose" family of locomotives. This type was built by Alsthom and MTE 1971-78 in 65 copies. It is a pure AC locomotive for 25 kV lines. 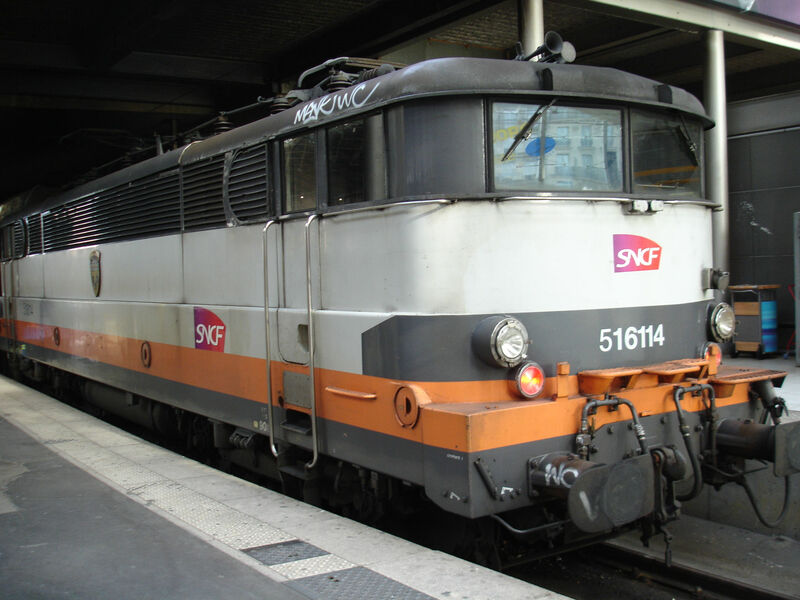 They were earlier widely used in high quality express and Intercité trains, but have now rapidly been pushed aside by TGV trains. It has a power rating of 4400 kW and a top service speed of 160 km/h. 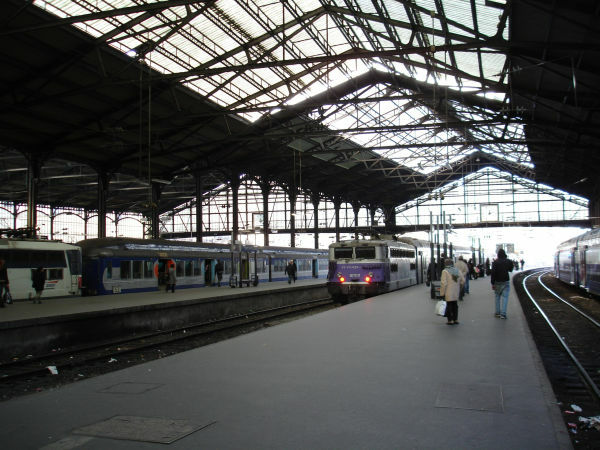 Picture from Paris Gare du Nord 27.1.2008 by Sanna Siissalo. Picture from Gare de l´Est in Paris 20.10.2017 by Ilkka Siissalo. 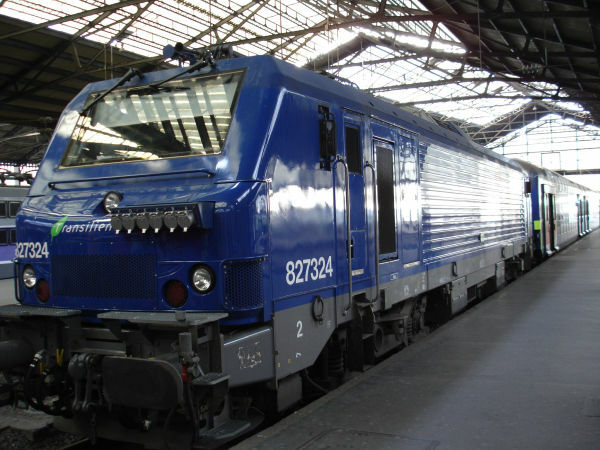 The BB7200 is the 1,5 kV variant of the "broken nose" locomotives. 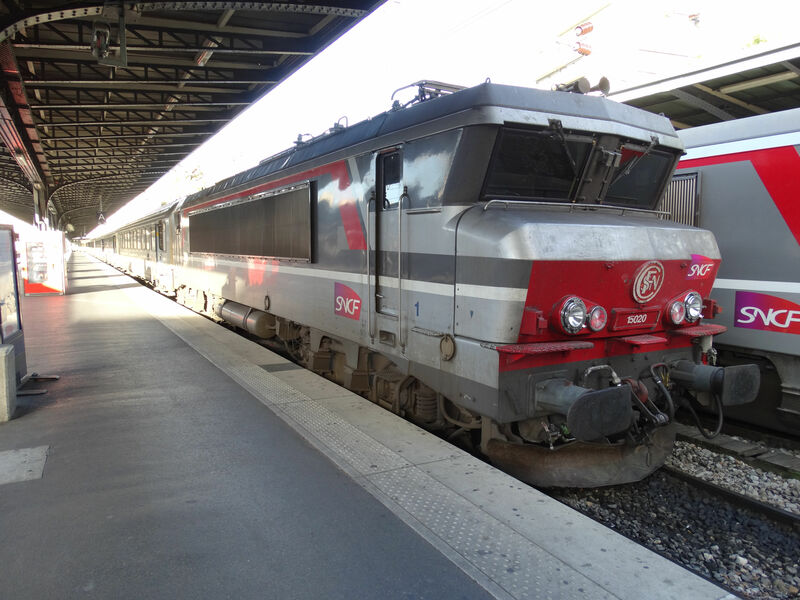 Here it is seen still in the so called "En voyage" livery. This painting/taping was copyrighted by a marketing agency and at the end of the agreement period SNCF now has to remove all the en voyage tapings from their locomotives, often resulting in dull grey locomotives with no colouring at all. 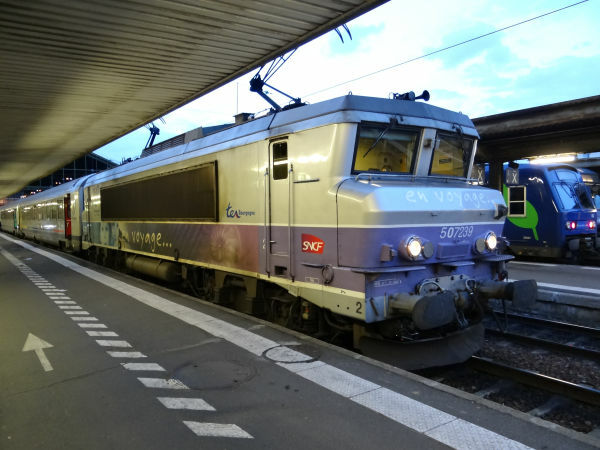 Picture from Paris Gare d´Austerlitz 19.10.2017 by Ilkka Siissalo. 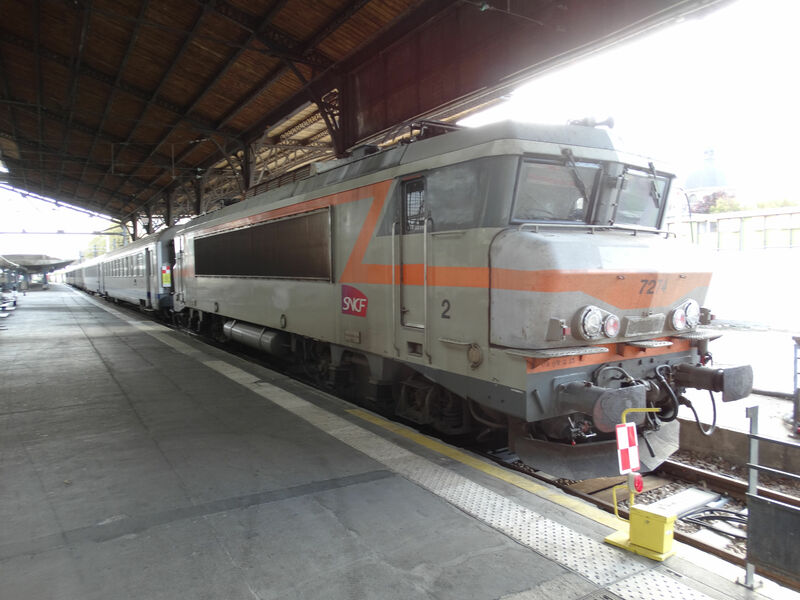 This BB7200 locomotive has still kept its earlier orange and grey livery. Picture from Paris Gare d´Austerlitz 19.10.2017 by Ilkka Siissalo. Another BB7200, but this one has lost its "en voyage" tapings and is now just dull grey. 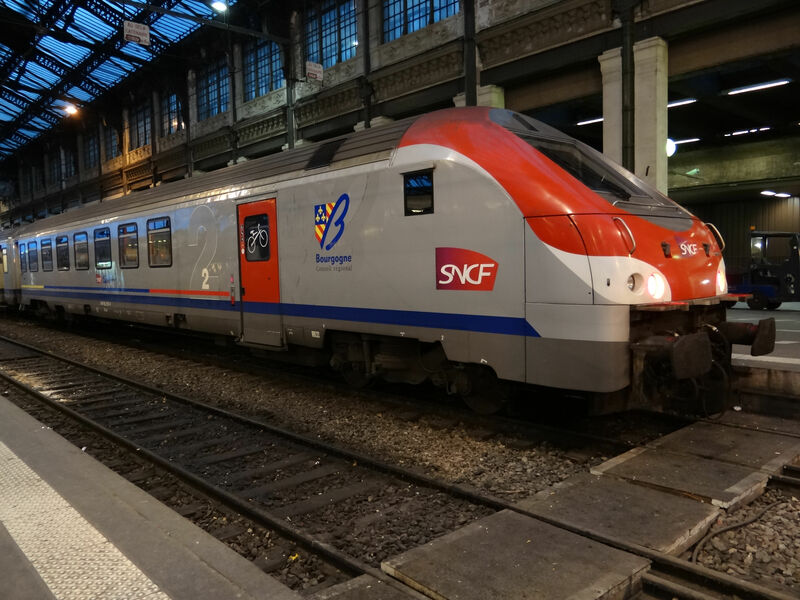 Picture from Paris Gare d´Austerlitz 19.10.2017 by Ilkka Siissalo. 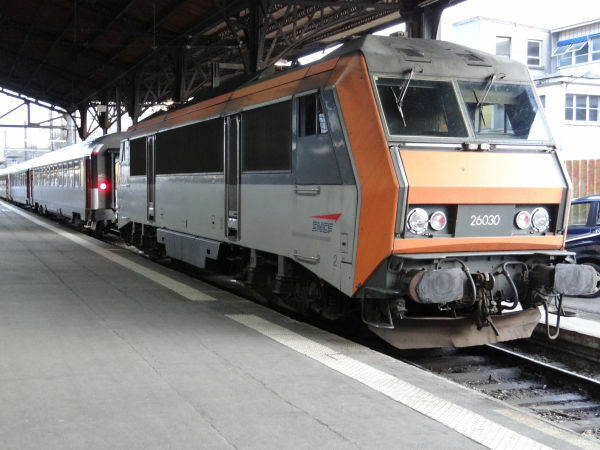 Another BB7200 in the "en voyage" tapings of the TER service of Bourgogne. 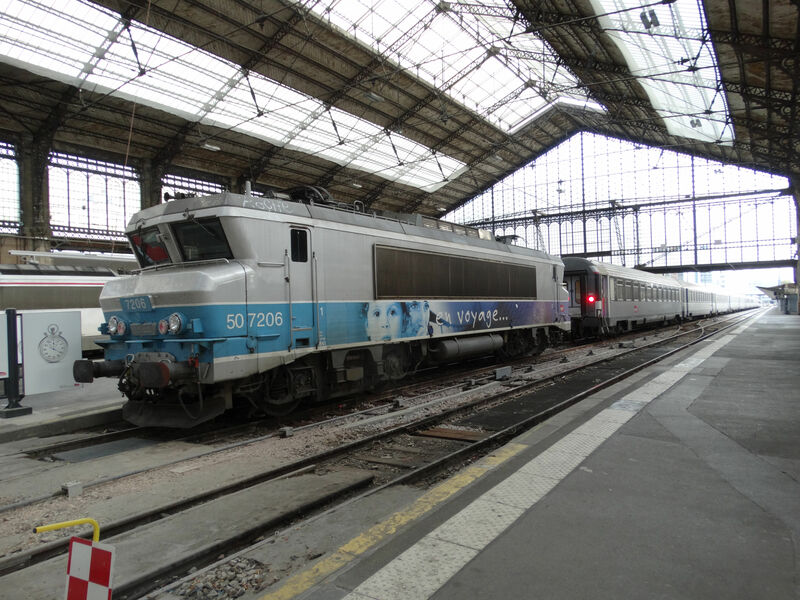 Picture from Paris Gare de l´Est 4.3.2014 by Ilkka Siissalo. This was the other end of the same train where the BB7200 locomotive pictured above was at the other end. A very stylish drivers' cab coach of TER Bourgogne. The BB26000 locomotive series is a dual voltage locomotive type also known as "Sybic". They were built by GEC Alsthom between 1988 and 1998 in 234 copies. They can operate with both 25 kV AC and 1,5 kV DC. Top speed is 200 km/h and the power rating is 5,6 MW. They were originally orange and grey, but this machine has apparently been in the "en voyage" livery and has now been stripped of all the copyrighted folios. Picture from Paris Gare d´Austerlitz 19.10.2017 by Ilkka Siissalo. 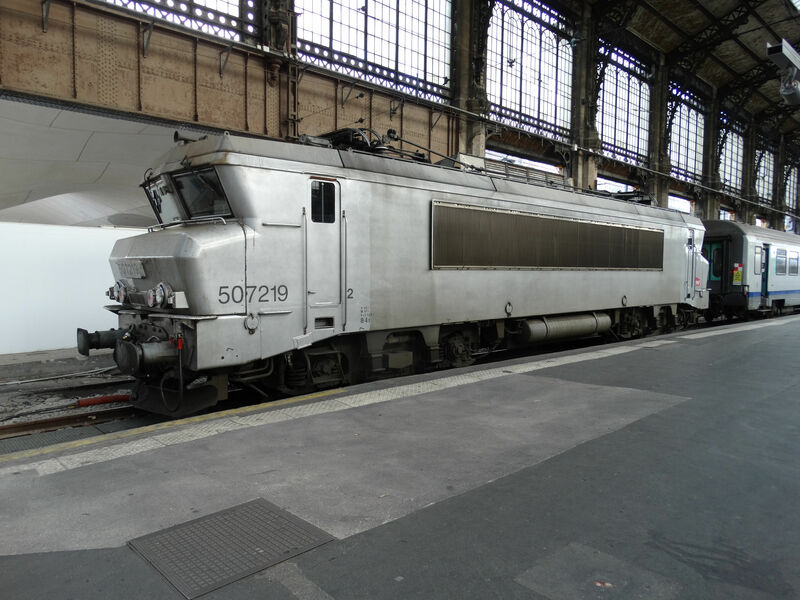 Another dull grey BB26000 "Sybic" locomotive. Another BB26000 "Sybic" locomotive, but this one has the very old orange front but still already new tapings along its front sides. This BB26000 "Sybic" is in the newest tapings. 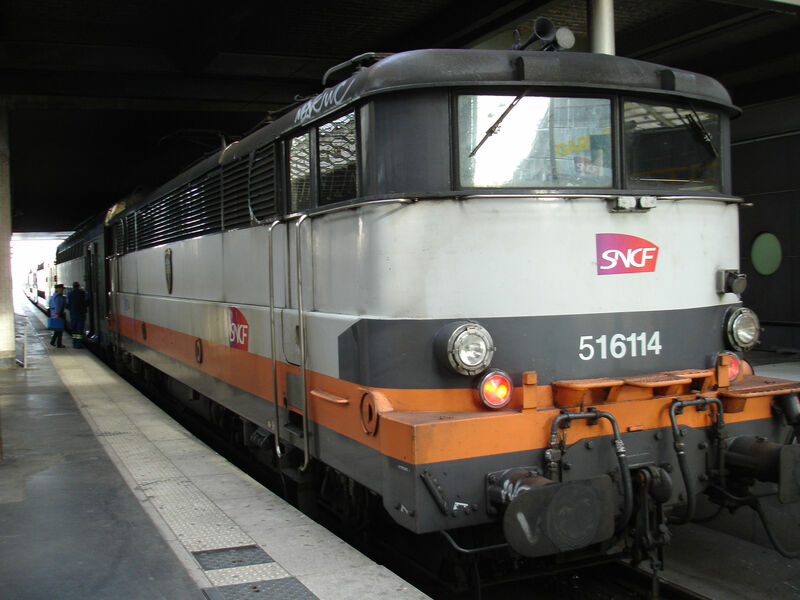 This BB26000 "Sybic" is still in the very first livery of these locomotives and it even still carries the old SNCF logo nicknamed "macaroni". Picture from Paris Gare d´Austerlitz 4.3.2014 by Ilkka Siissalo.